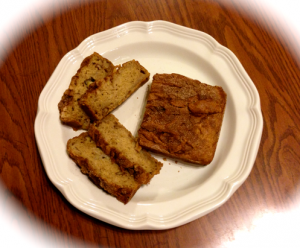 My Great Grandma’s Banana Bread - Now Gluten Free! 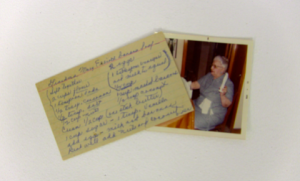 I catch myself saying this phrase all the time to friends and family as I hand them my favorite baked good, “I am just like my Italian Great-Grandma – I LOVE to feed people.” One of my treasured childhood memories is going to visit my Great Grandma Elliott. She had the softest skin I had ever kissed and the most beautiful silver bun that she wore on the top of her head. I had visualized many times what her hair might look like down and once, just for me, she pulled out her many pins and let me run my little fingers through the softest, longest hair I had ever seen. Our visits were never complete until we had received a loaf of her banana bread on the way out. I vividly remember her getting out of her chair, walking slowing with her cane to the kitchen as she said to my Mom, “Now Joanne, you can’t leave without a loaf of bread.” My sisters and I were always thrilled. I was blessed to have my Great-Grandma Elliott in my life until I was eighteen years old. About ten years ago while going through a box of my childhood treasures lost in my parent’s attic for many years, I found a letter from my Great Grandma sent to me when I was eight years old. Inside she had included a recipe card upon which she had written her banana bread recipe. Seeing the recipe in her writing and thinking about her many gifts of bread brought tears to my eyes. I was so joyful making that first loaf of bread for my family – delicious and just like I remembered. Fast forward to 2009. I have been a yoga instructor for several years at this time and had incorporated mindful eating into my life, but still suffered from constant, severe acid reflux and Irritable Bowel Syndrome. I was on a high dose of acid reducer twice a day, had a colonoscopy which found nothing, and had tried medicine for the IBS without relief. What I found out on my own was that I am “gluten intolerant”. Dropping gluten from my diet along with my healthy, mindful eating completely cured my acid reflux and IBS. Knowing the impact that dropping gluten had on my own body, I now looked to make the changes for my husband and four children. My goal was to be able to still make them homemade treats that allowed me to drop the gluten, lower the sugars and have the peace of mind knowing all the ingredients that were in their treats. Over the years, I have tried many types of “gluten free” flours, but my children would always ask, “what did you do to the bread?” And say, “we liked it better the other way.” But, as a mother, I had not given up and was still on a quest to find a good gluten free flour.On a recent shopping trip to Costco, I happened upon “Namaste Food’s Gluten Free Flour”. As a yoga instructor, the name of the company immediately caught my attention. Upon reading the back of the package, I saw that they were a “group of mom’s who are deeply committed to our families, our communities, and of course, good food.” That sealed the deal for me – I was ready to try again. I happily pulled out Great Grandma’s recipe and made her bread, this time with Namaste Food’s Gluten Free Flour. As my children paraded in that day after school, I anxiously awaited their response. I tried to act casual as they took their first bites. All at the same time they began to say, “wow Mom, this bread is AMAZING”. My seven year old, Ben, actually said to me “Mom, you outdid yourself on this one.” First, I was shocked that he knew this phrase and as my youngest and toughest critic in the family, I knew I had found something great. Now it was my turn to try the bread. Let’s just say that after one bite, I wanted to eat the entire loaf. My banana bread tasted better than it ever had, so moist that it almost melted in my mouth. 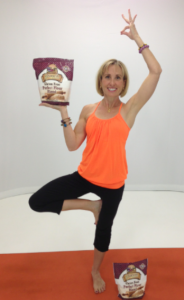 I am now using Namaste Foods Gluten Free Flour for all my recipes – pancakes, muffins, cookies and cakes all taste amazing. In a large bowl cream together butter and sugar until completely blended. Add in vanilla, milk and eggs. Mix well. Peel and mash bananas in a separate bowl. Add in bananas and mix well. Add in Namaste Foods Gluten Free Flour Blend, soda, cinnamon, salt and walnuts. Divide mixture between evenly between two greased bread pans. In a small bowl measure 3 ½ tbsp. sugar. Add in ½ tbsp. cinnamon. Mix well. Spray two loaf pans with cooking spray. Divide mixture evenly between both pans. Spread two tablespoons of topping evenly over each loaf. Place uncovered in the oven at 350 degrees, 35-40 minutes. This is an excellent article! Thank you!